Tulku Tsultrim Zangpo (Tib. ཚུལ་ཁྲིམས་བཟང་པོ་, Wyl. tshul khrims bzang po) aka Tulku Tsullo (སྤྲུལ་སྐུ་ཚུལ་ལོ, Wyl. sprul sku tshul lo) (1884-c.1957) — one of the greatest Tibetan scholars of recent times, was an important student of Tertön Sogyal Lerab Lingpa, as well as the author of his secret biography and a lineage-holder of his terma teachings. He was also a student of the Third Dodrupchen Jikmé Tenpé Nyima and of Amye Khenpo Damchö Özer of Dodrupchen Monastery. Khenpo Damchö said of him on one occasion, “I am just a dog, but I have a lion for a student.” Although it was notoriously difficult to meet Dodrup Jikmé Tenpé Nyima in his later years, Tsullo was able to do so because of his work as a scribe. He copied many texts for Dodrupchen Rinpoche’s personal library and used the work as an opportunity to get access to Rinpoche and to receive clarifications. Tsultrim Zangpo’s father was Gönpo Wangyal and his mother was Shyiwam Tso, daughter of Khordong Terchen Nüden Dorje. 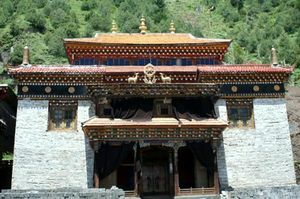 His main residence was at Shukjung Monastery in the Do Valley, which is located about 15 to 20 miles from Dodrupchen Monastery and which belongs to the Northern Treasures tradition. He also spent time at Khordong Monastery, which was under the care of his younger brother, Gyurme Dorje. Those who saw him say that he looked statuesque, seated in meditation posture, hardly ever moving, and with an impressive white beard. He was the root teacher of Khordong Tertrul Chime Rigdzin, popularly known as C.R. Lama (1922-2002), as well as Orgyen Tendzin (Tulku Gyenlo) and Zhichen Ontrul Rinpoche, who passed away recently in Tibet. The day before Tulku Tsultrim Zangpo passed away, there had been a domestic dispute between his niece and his young monks. When he was told of the problem, he felt, "I have been teaching for more than 30 over years and yet my teachings have not helped those people, even my own people are not able to live harmoniously, so there is no point to live on." Therefore, Tulku Tsultrim Zangpo 'caught' a flu the same evening of the dispute, and he passed away peacefully in meditation posture the following day. After that, he stayed in Tukdam for six weeks, and the wondrous smell of his body permeated equally in about 1 km radius. As soon as he left his meditative state, all the followers requested Zhichen Ontrul Rinpoche to take the responsibility of cremation. On the night of cremation, Zhichen Ontrul Rinpoche dreamt of Tulku Tsultrim Zangpo riding confidently on a white horse in the direction of a high and gigantic spiraling mountain, telling him, "I am leaving for Zangdokpalri to be reunited with Guru Rinpoche. And you will follow my footsteps, but not now." He had two main reincarnations, Chökyi Nyima Rinpoche of Nango Gonpa Trango and Tulku Lungtok. Tsultrim Zangpo was a monk who upheld the Vinaya, as well as an accomplished tantric adept, and among his writings is a two-volume commentary on Ngari Panchen’s Ascertainment of the Three Types of Vows (སྡོམ་གསུམ་རྣམ་ངེས་, sdom gsum rnam nges), as well as several texts on Dzogchen, including an instruction manual (ཁྲིད་ཡིག་, khrid yig) for the Gongpa Zangthal, which has been translated into English by Tulku Thondup, and a commentary on the famous Prayer of Kuntuzangpo. His other writings include a commentary to Padmasambhava’s Garland of Views and many works related to the tantras of the New Translation tradition. His unpublished commentary on Jikmé Lingpa's Treasury of Precious Qualities, based on teachings by Dodrupchen Jikmé Tenpé Nyima, was recently discovered in Tibet. ↑ The birth year of 1884 is given in Tulku Thondup's Masters of Meditation and Miracles. According to the Khordong monastery website he died at the age of seventy-three. We know that he wrote the secret biography of Tertön Sogyal in 1942. Kun bZang dGongs Pa Zang Thal- Boundless Vision: A Byangter Manual on Dzogchen Training. An Outline Commentary on the Boundless Vision of Universal Goodness, Edition Khordong. This page was last edited on 9 December 2016, at 14:54.